London: Macmillan, 1993. 188 pp includes index and bibliography. Through analysis of research and discussion of government policies, the reader is introduced to an explanatory framework by which current and future housing problems may be understood. Softcover has very minimal wear, no creases. No former owner's name. Text is clean and unmarked. A few pages have production faults along top edge, does not affect text.. Trade Paperback. V. Good. United Kingdom: Macmillan Pub Ltd, 1992. 145 pp. includes index and references. Designed to help social work staff avoid becoming the victims of violence in their work and to respond appropriately in situations in which violence is offered. Softcover has minimal wear, a bit of a bump to back bottom corner, clean and bright. No former owner's name. Text is clean and unmarked.. Reprint. Trade Paperback. V. Good. London: Macmillan, 1993. 192 pp includes index and references. 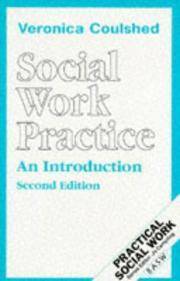 A Simply-presented, concise guide to the main theories and methods that underlie effective social work practice. Softcover has very minimal wear, no creases, no former owner's name. Text is clean and unmarked. A nice copy.. Second Edition. Trade Paperback. V. Good. London: Macmillan, 1994. 158 pp includes index and references. A comprehensive guide to practical and theoretical issues in symbolic, non-verbal and written communication. Dustjacket is in great condition, no tears and minimal wear. Black paper on boards binding has a wee bump to bottom front corner. Bright and clean. No former owner's name. Text is clean and unmarked. A nice copy.. HC and DJ. V. Good/V. Good. 9 x 5 3/4. New York, NY, U.S.A.: Routledge, 1984. 257 pp includes references and index. General Editor Frank Parkin. A Tavistock studies in sociology. Argues that most serious crimes are committed by persons in positions of power and privilege, and that some relatively powerless groups hardly committ any serious crimes. Dj has minimal edgewear, no creases to corners, one faint one to spine. No former owner's name. Some yellow highlighting and pencil notations in text.. Soft Cover. V, Good. 8 1/2 x 5 1/2.